The morning ritual of the pilgrim is, itself, a fascinating thing to behold. In some places around the world the morning comes with sounds of birds singing or roosters… maybe a dog barking. 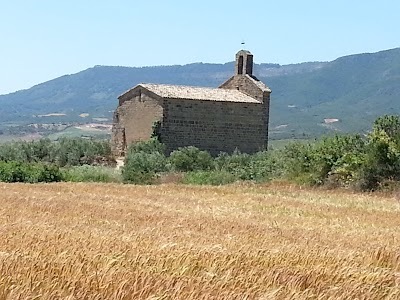 In a albergue on the camino, it comes with pilgrims rustling through backpacks in the dark and the sounds of swearing in many languages as travellers bump their heads against the bunkbeds or stub their sore toes against the uneven floor boards. If you haven’t risen by 6:30, the lights come on. 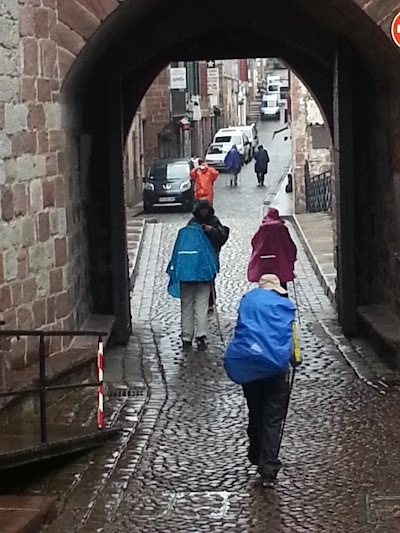 All pilgrims are required to be out of the hostel by 7:30 or 8:00 so the hospitaliers can get ready for the next wave of pilgrims to sweep in later in the afternoon. And there is a lot to be done. A quick inventory of the packing routine: toiletries to do your morning bathroom routines… This includes the full routine of footcare – which on the camino, is like praying to the gods who are looking over you. Any failure to adhear to the proper ritual is taking your life into your hands… You will need to repair any untended blister – including popping, draining and sterilizing new blisters, binding old ones with compede or moleskin and possibly a larger wrap. Then, there is the necessity of massaging in the vasoline to keep your feet soft and avoid excess rubbing inside your boots which makes you prone to blisters. All of this will be discussed in great detail by fellow travellers over beers at the end of the day. Any failure or reticence at due ritual diligence will bring upon you scance looks – really no different than ancient religious rituals in the earliest days of the camino in the 1400s. Also critical is remembering to pack all the electronics you had charging overnight without any failure to remember the 240-120 adapters in the electrical outlets. 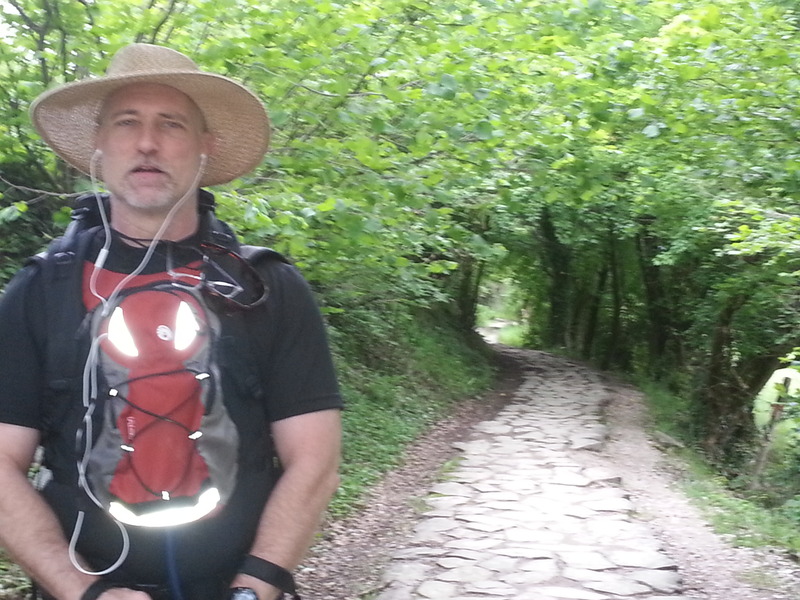 Then there is the full slathering of sun screen needed for these heat laden strestches of the camino. If you still have any clothes hanging on the line from the previous days laundry, you need to get that. For the last three days, Liz and I have began our day at 5:15 am and it takes us an hour to pack, do foot care, make a little breakfast and snack for the road and head out on the camino. The early hours are the best. Cool. A flattering light creates a mystical ambiance over the horizon and it gives the town you are walking out of an unmistakable aire of beneficence. Of course the day always looks a little brighter when it starts with a taste of wine. 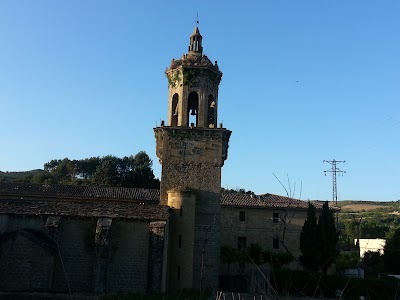 The Bodegas of Irache, just outside of Estella, contained a monastery where the priests tilled the grapes of the region and distributed wine from a fountain to the weary pilgrims. 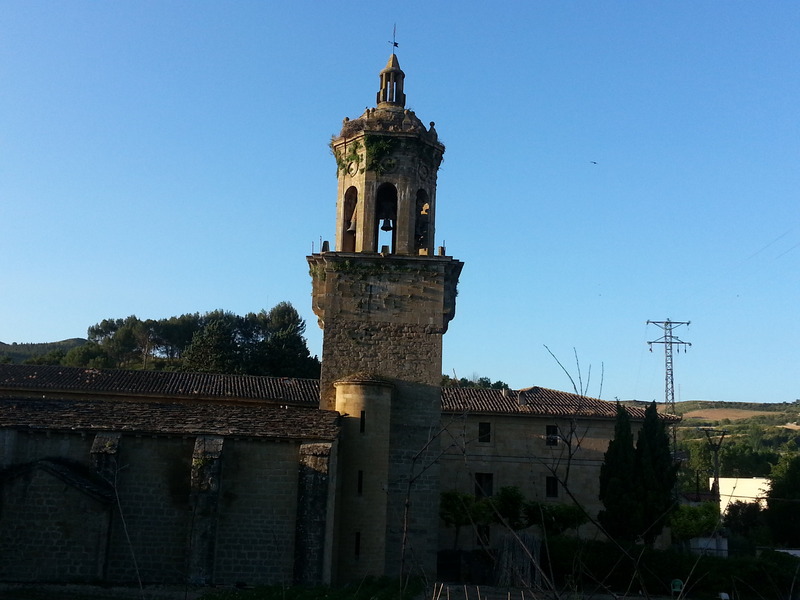 The monastery failed in the 1980s due to a lack of novitates but the winery that purchased the land kept the wine flowing from the fountain. Many pilgrims filled up their canteens for the long journey – or for the storytelling at the end of the day. 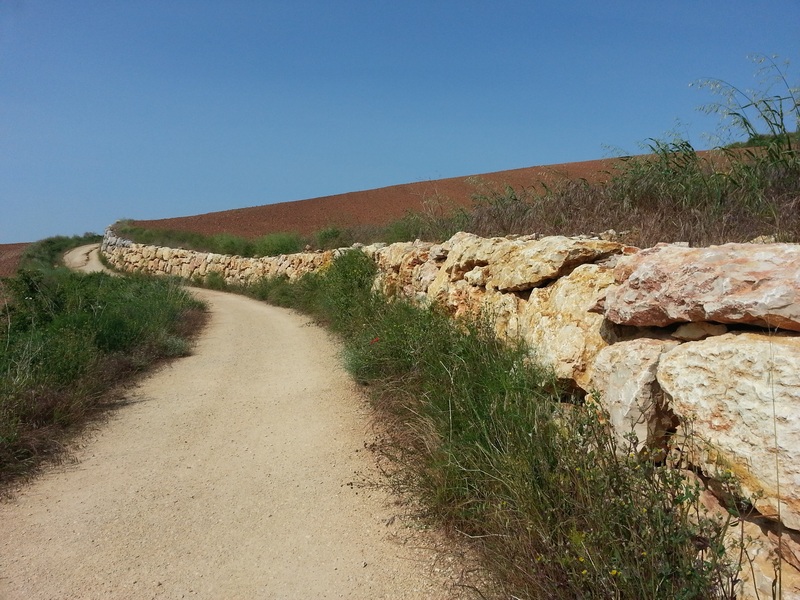 A rock wall surrounds the city which is very impressive. Each of the rocks have to weigh at least 3-5 tons. How they found their place must be a very interesting and long and complicated story of freedom, how it was secured, for whom and for how long. We are always trying to free ourselves from the things that bring us pain. 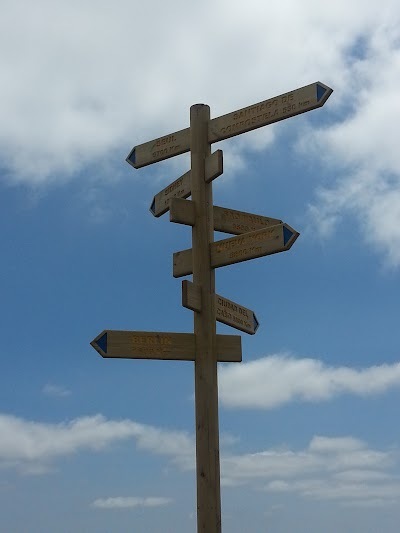 One of the rituals of the path is to symbolically leave something at one of the markers designating how you have left some sadness or grief behind, or that you are remembering someone or something that has known, given or received pain. Of course, although it is less common, leaving footwear is a very fitting testimony. Arriving in our destination – this day it is Los Arcos – has become a very wonderful ritual. There is the reunion with all our fellow pilgrims – many of whom we´ve met and had some lengthy conversations and forged some affection. There is a celebration of realization that we are reunited – one never really knows when you head out for the day whether you will see anyone in particular again. 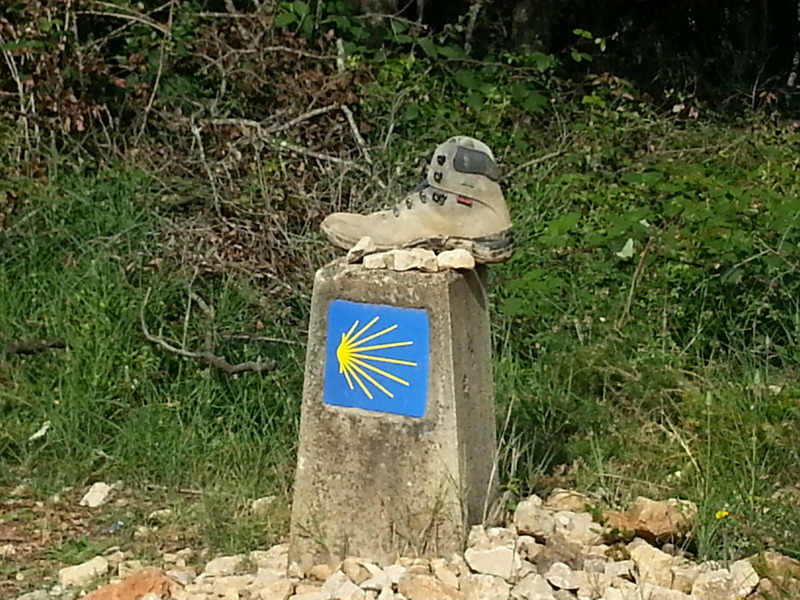 Some people are on the camino for a shorter period – only doing parts. Some travel ahead. Some lag behind. Some are injured. Nothing is taken for granted. And the days of walking are laden by each person with their own pervasive introspection. To arrive at the end of the day with a familiar face who you know has shared a little bit of your experience is exhilarating and sustaining. The night in Los Arcos came to a close with Linda (the school counselor who carries a blender in her pack and walks faster than anyone else – a cross between a maverick and a mule on the camino… and Kevin, the religious studies teacher at an all girls high school in Miami. After dinner, we were off to see the cathedral and receive the judgmental looks from all the elderly ladies of the town for not looking respectfully Catholic enough. 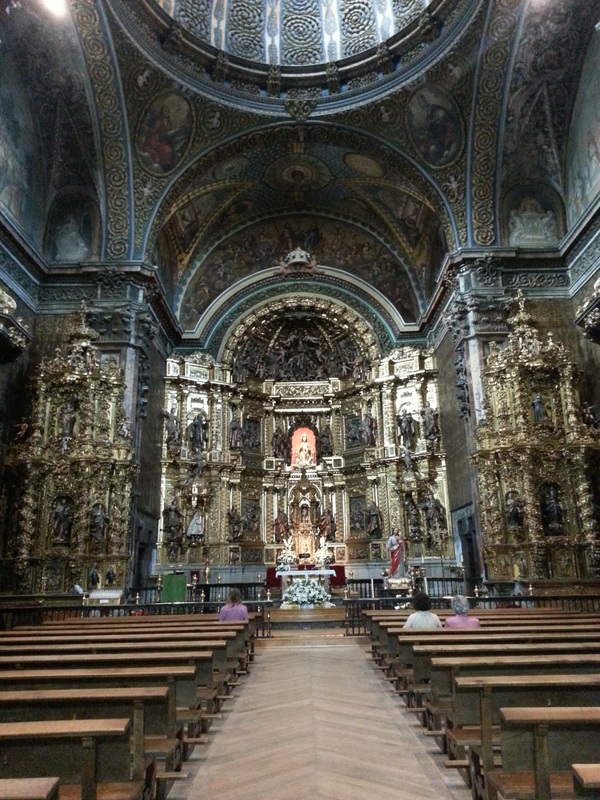 The inside of the Cathedral was ornate with elaborate bronzed statues of the saints. Just the figures who could grant us the beneficent fortune of finding our laundry still hanging on the line, a good night´s sleep and safe journeys in the morning. 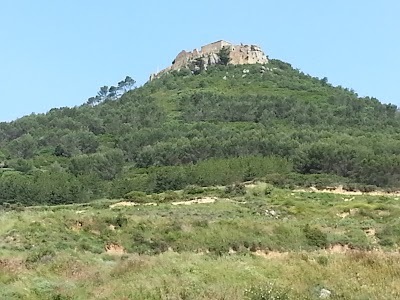 I´d been listening to Pema Chodran – a Western buddhist monk – teaching on ´How to get unstuck´ during the trek to Puenta de la Reina. One of the things she talked about was ´chenpa,´ which is that velcro-like disposition in our countenance which brings about struggle. She talks about how we always project our ´chenpa´ on other people – as though THEY are the ones who make us angry or irritable when what they are doing is really pressing our own internal triggers of fear or insecurity or discomforting inadequacy. It is our chenpa that makes it hard for us to move from one part of our life that may be fading and jump into the next aspect of our life demanding that we be present. I remember how much grief and sorrow and pain my mom felt in the last 6 years of her life after we tried to get her to move out of Los Angeles up to Monterey where Liz and I moved and where Lisa lived close by. You could see how the whole concept felt like loss of everything she knew and appreciated about life – especially the warmth of the sun that had become powerfully sustaining for her – especially as some of the other strengths she´d counted upon began to slip through her fingers (her memory, her hearing and eye sight, her motor reflexes and ability to drive). I remember her on many occassions being close to tears after arriving in Monterey, complaining that it was cold and reaching back into her life and threatening to go back to LA just to be warm again. I brought a small bottle of her ashes with me on this trip and I placed some of them on the grassy knoll outside the church in front of the hostel. The climate there is just like Southern California and the traffic of friends in and out of that hostel – with their readiness to be joyful in one another´s company… these were the things I thought she would recognize most as sustaining. I felt my own loss as I poured out a portion of the ashes I placed there, knowing that there is part of me that is not ready to let go of what I know is gone and yet recognizing that there is something within the past that recognizes its place and begs to be there. As we started to walk out onto our path for the day on the way to Maneru, I thought about Pema Chodran´s teachings again. Especially as the morning sun was shining on our back and how we were walking up a steep, uneven path to the city on the hill. 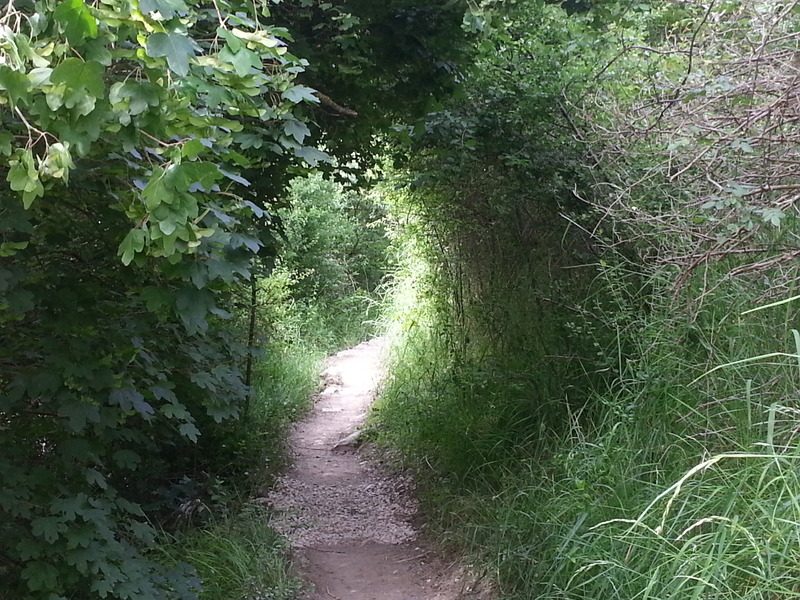 We´ve encountered so many different kind of trails on our walk. There is the smooth path, which tired and swollen feet prefer the most. And there is the muddy paths which require some very judicious stepping. There are the rocky paths which your brain becomes highly attuned to since one careless step can accentuate the pain in your feet, ankles and knees. 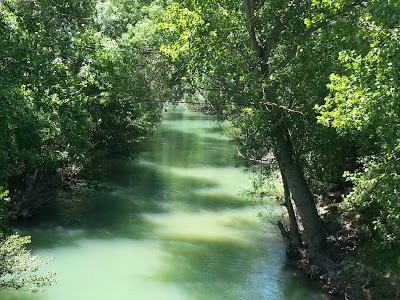 As we were walking it became clear that I was walking into my own shadow, which sometimes made it much more difficult for me to see the exact place I needed to step in order to maintain my physical – and emotional – balance. And it occured to me that the camino is here to remind us – in a very immediate way – of the bigger picture of our trail thorugh this world. We are always – every minute – walking right into our chenpa and it is asking us to be present, choose thoughtfully and attend to and appreciate all the feelings and attitudes that come before us. 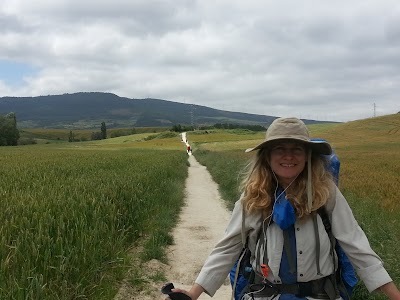 I´ve been telling myself that one of my cheif goals on this camino is freedom. Which is to say to have the autonomy that Arun Gruen talks about: having access to the full range of thoughts and feelings the world – and all the people in it – have known for millenia. I want to see them, greet them, try them on and understand the message they are trying to hand me without employing the filters that try so desperately to only encounter the feelings and thoughts which are pleasant. The unpleasant feelings are often the ones that grant access to the compassion that those around us need from us to reckon with their own chenpa. Liz and I had a very sweet conversation about the kind of relationship we want from one another and realizing that it is the kind of powerful and abiding connection born of a love that is constantly present, broken, mended, relished, broken and mended again. It is a relationship made strong and resilient and reliable like proud flesh. 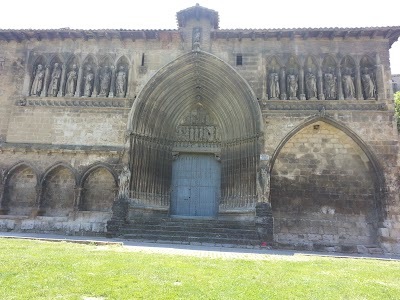 Liz and I talked about this on our way to the hill town of Cirauqui. In the entrance to the town we found a stamp for our credncials in the archway to the city. We found some of the loveliest landscape on this day. 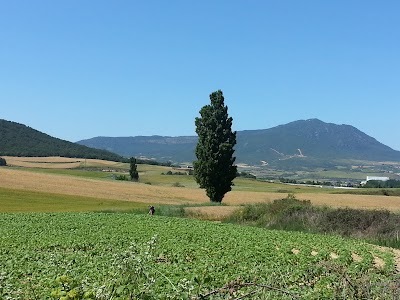 Beautiful farmland and picturesque landscapes. 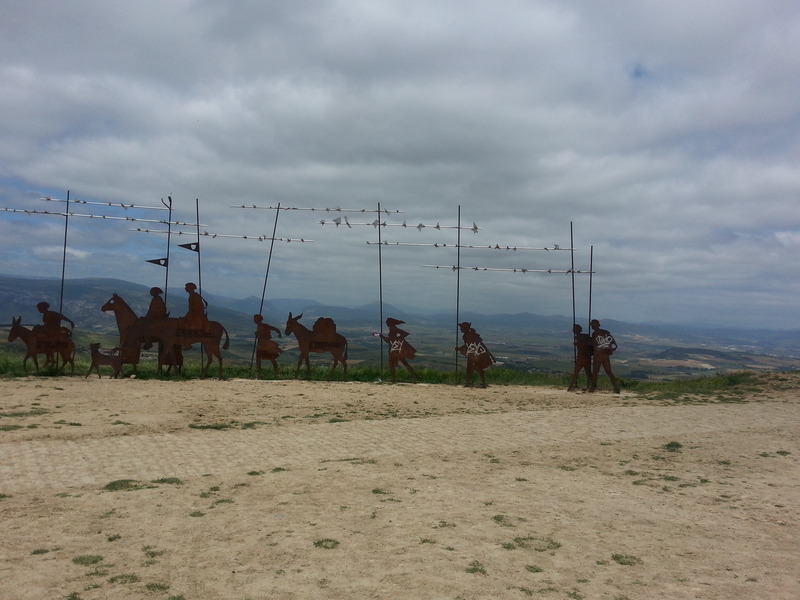 The camino winds its way through almost every town on route to Santiago. There is always a unique and amazing cathedral and signs of communities that worked hard to forge places to gather and share their lives and the meaning they cobbled together. So many town squares and public fountains. 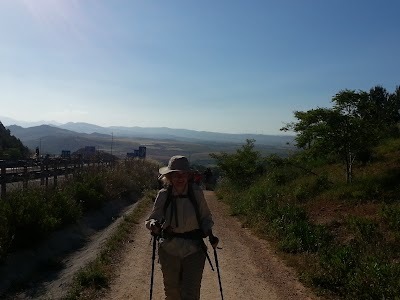 Again, by the time we crossed over into the 20 km threshold, our feet began to scream about the punishment they were enduring for the benefit of the rest of our senses. 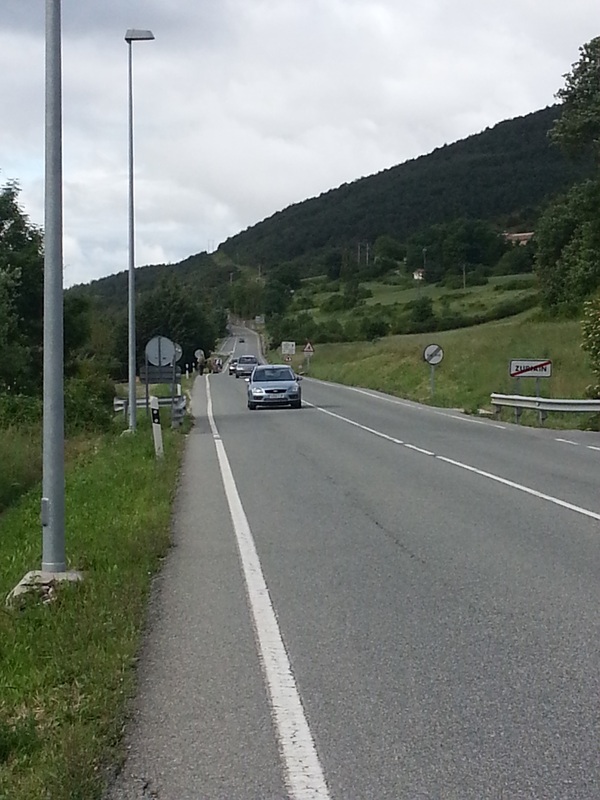 We saw a sign that said 2.4 km to Estella which we now know is the longest 2.4 km anywhere on the planet. Even though we were seeing some of the most beautiful terrain of our trip, Liz – for the first time on the trip – was beginning to lose it. But she gathered her countenance and spirit and forged ahead. I believe she began to understand how pressing through some of the physical demands, she was discovering a little about what was underneath. Her soul – and my pride for her – grew a lot in that last 2.4 km. 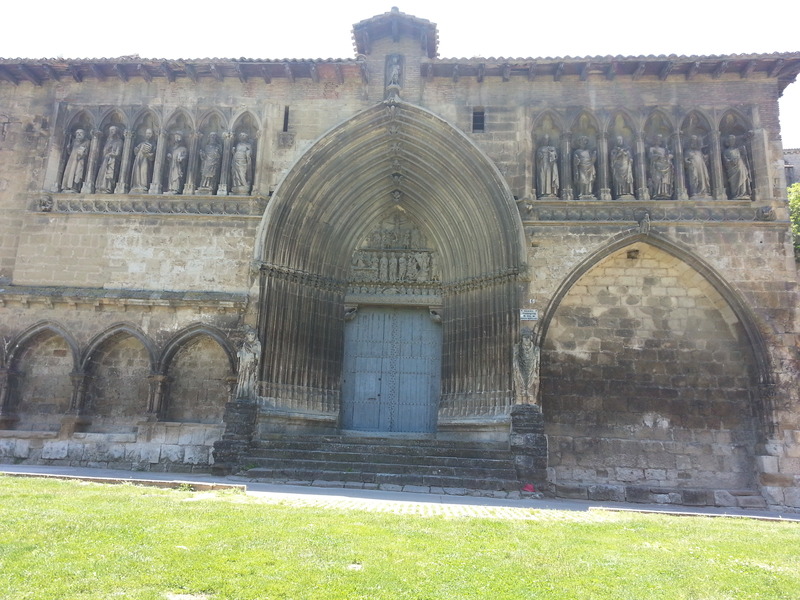 Estella is a lovely town with two great cathedrals and a town square with a fountain. 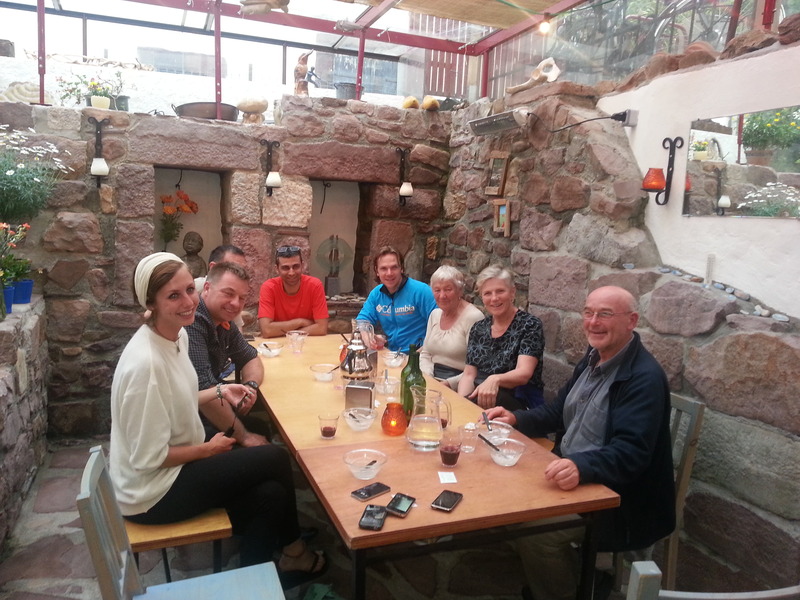 We had a pilgrim´s meal in a local restaurant and great conversation with a number of other pilgrims – including a family from Santa Cruz. Day 6 ends with our bodies weary and our souls as large as ever. 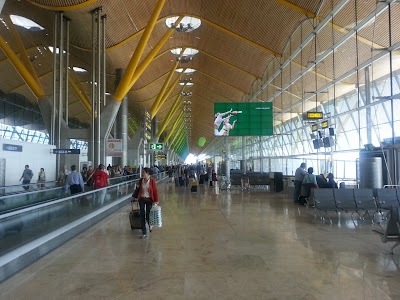 The original plan was to seize the slim chance that efficient planning and careful execution and a beneficient world of train and plane and bus schedules would afford and visit a Vodafone store (Wireless phone service provider) in between when our flight arrived in San Sebastien and when our train left for Bayonne. It wasn´t clear whether it was our efficiency, execution, or the drunken laughter of gods of travel that made swiss cheese of our slim chance… suffice it to say, we went to plan B – to visit a Vodafone store when we entered Pamplona on Day 3 or 4. We thought we were doing really well keeping up with the recommended pilgrim´s schedule and arriving in Pamplona on Day 3. However, we didn´t properly calculate that day 3 would happen to be a Sunday and that, on Sunday, none of the shops (except grocery stores and some bars and a few tourist places) would be open. 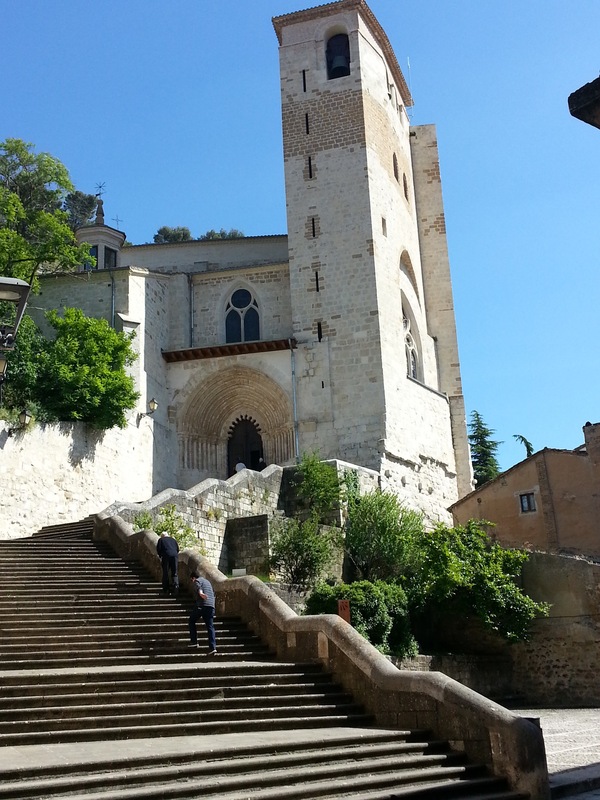 Plan C was to wait until Monday morning when the Vodafone store opened at 10 am – a three hour delay after most of our fellow pilgrims had left for the day. This is what we did. And after a great breakfast of olive-churizo-gouda sandwich on fresh baked bread, we were negotiating with the Vodafone folks. They sold us a plan that, last night, the Vodafone service rep said on the phone, we should ask for our money back, but that is a sad story not worthy of this blog. 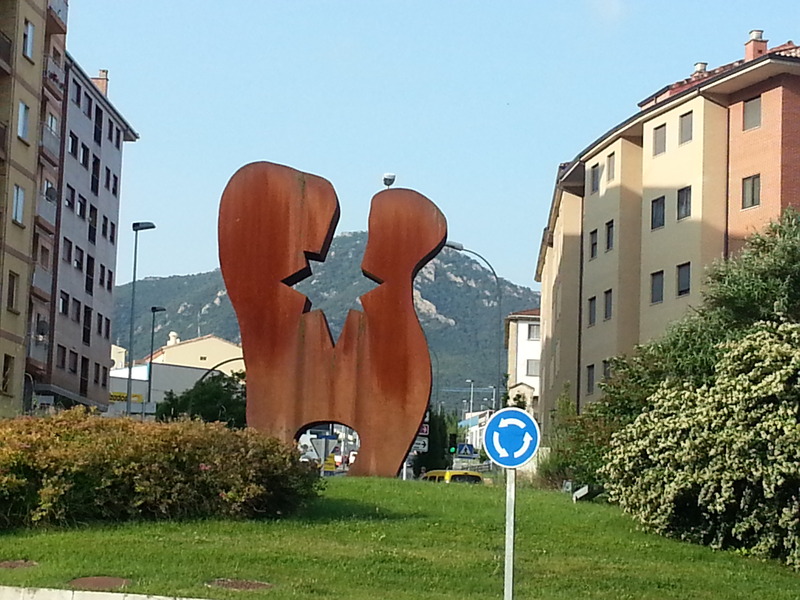 Suffice it to say, we did not leave Pamplona until 11. This, in addition to making up an extra 7 kilometers (the distance between Pamplona and the city in which we were supposed to stay, Cizur Manor), so we were looking at a 28 km day. Everything started out well. We´d moved into the rolling terrain of wheat and wildflowers, occassionally going through some lush territory climbing the mountains. A few long hills that tested our wind and some steep down hills on unsteady rocky surfaces that tested our knees. 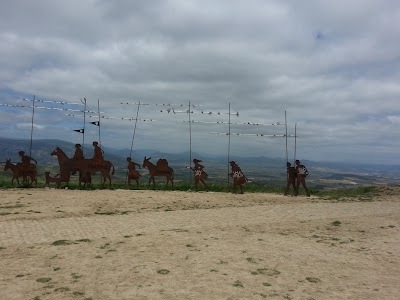 By the time we made it to the ridge (Alto) of windmills with the bronze monument to the pilgrims, we were already sore and weary – with another 14 km to go. A long trek straight down a dry river gorge was punishing on our knees, feet and spirits, so by the time we got to Urterga, we were wiped. A whole slew of pilgrims – many of whom we´d been travelling with and liked a lot – were out in the courtyard having beer and laughing and eating. 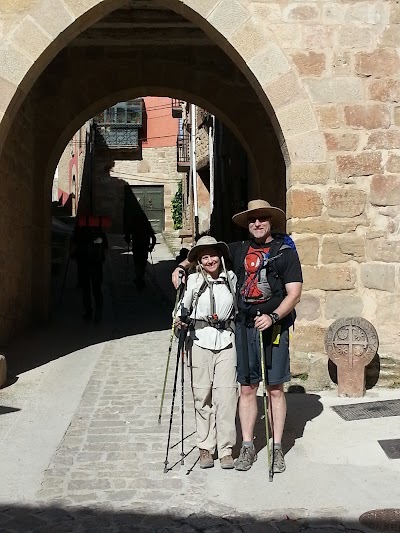 We hoped that they were staying there but soon after we arrived and took off our shoes, they said they were just on break and moving on to the scheduled stop of Peunta de la Reina. We did some blister repair work and had a potato sandwhich and moved on as well. I´m sure that being stabbed in the forehead repeatedly with an ice pick would be painful, but I´m no longer prepared to place too many things higher on the scale of suffering than walking up and down hills when your feet are so swollen they feel like they a ballooning out of your boots. 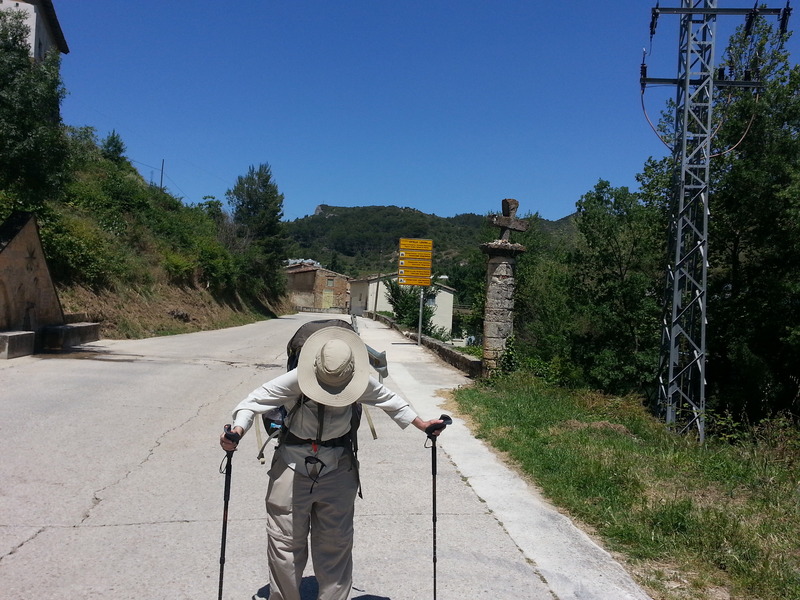 By the time we made it into the town of Obanos, we had already used up our last legs and using lost legs. 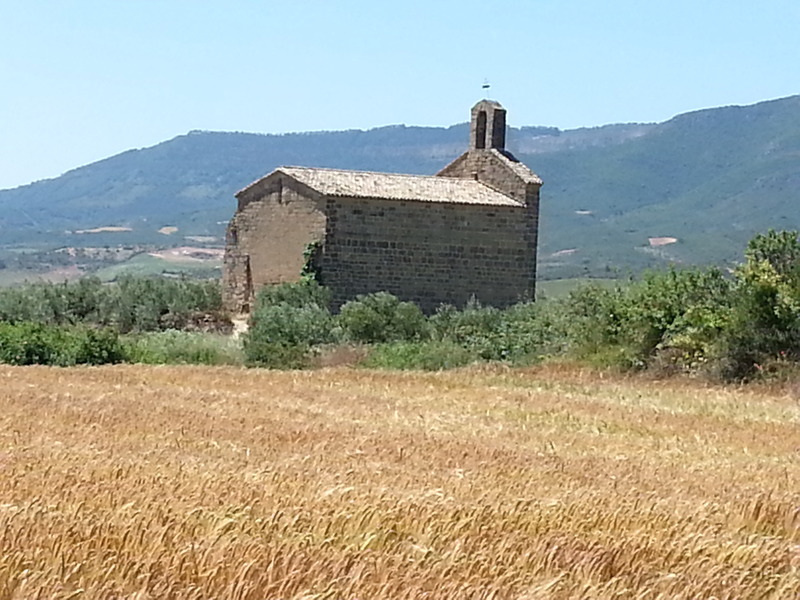 But heading out of Obanos and toward the last 4km to Peunta de la Reina, we encountered something that changed us a bit. There had been a woman who was travelling with 100-200 pilgrims who were roughly in our travel schedule (arriving in towns and staying in the same hostels as us). We´d noticed her several times because she stood out from the other pilgrims. She was blind. Certainly not totally blind, but she did have a handicap sticker on her backpack and often used a blind walking stick inside the hostels. We´d not talked to her but sort of were in awe of her from afar. But as we were on the road out of Obanos, there she is hiking back up the road into Obanos. 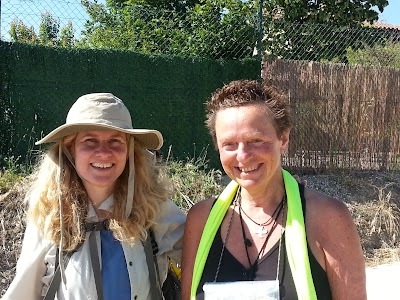 We chatted and discovered that her name was Talida, and this was the last day of this year´s camino for her. She was completed an uncompleted leg that she´d done last season. 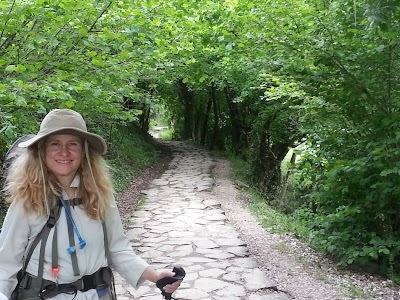 It turns out she had completed six caminos and was about to embark on a new one from a different route. When we asked her why, she said that ever trip on the camino was amazing and came with new ideas and new lessons, new people, new memories. She had a lightness to her spirit that would make you question who had the disability. 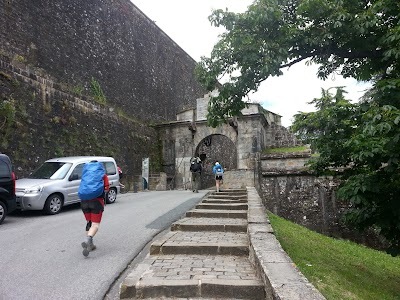 When we dragged our way into the hostel it was hot and we were sweaty but felt the boyancy of seeing many of our fellow pilgrims waiting for us. They´d arrived about two hours before us, had showered and were now fixing the dinner they had purchased in the local supermarket for a feast. Liz and I showered and relished in our daily ritual of giving each other foot massages and wound care. After walking the quarter of a mile into the center of town we found a place that served tapas and we enjoyed a great meal. When we returned we found twenty pilgrims in the common area polishing off their fourth or fifth bottle of wine and singing south korean drinking songs taught to them by one of our asian perogrinos. Too tired to join in, we made our way up the stairs and rushed into the arms of sweet slumber of some rather boiserous ´oopas!´ which proved to be the last sounds at the gates of our own slumber. One of my favorite poets, David Whyte, recorded a collection of poems called ´Pilgrim´ which I listened to again on the first day of the camino (walking in the rain up the Pyrenees to Roncevalle). 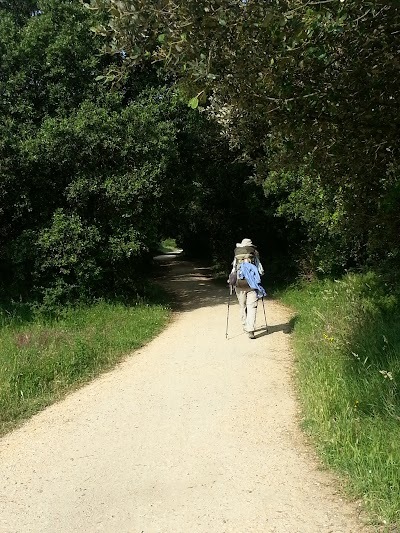 One of the things he talked about was the underlying spiritual motivation (or, perhaps consequence) of becoming a pilgrim and going on the camino is the constant striding toward reconciliation with something to which you have become estranged. Whyte talked about it perhaps being a sibling or a parent or the rumination about an old love you no longer know but continue to carry with you in you mentally and emotional rucksack. I think this reconcilliation can also be a bit more personal and can point to places of estrangement with our own selves. Certainly the mutiny my own feet and knees have been colluding toward against me might suggest a special need for forgiveness. And, in the morning after a tantrum of grief or hurt is allowed to let go and flow – like receiving metamusal of the soul – there is a new relationship of tenderness and compassion. The first thing that all pilgrims do is take inventory and read the morning’s casualty report. And once the news sinks inthat a body part has fallen in the line of duty, there is a remakable flow of compassion and care toward that part of yourself that needs a little extra attention. There is a strength that is built up over years and years of being torn down and built back up. When an injury has been incurred so many times that the affect of all the rehab and attention has brought about a reliable and personal familiarity with the limits and the needed care and accomodation required in being human. In horses, this kind of repeatedly rehabilitated injury is called ‘proud flesh.’ Of course it happens in our human bodies too. And, on the camino it happens every day. 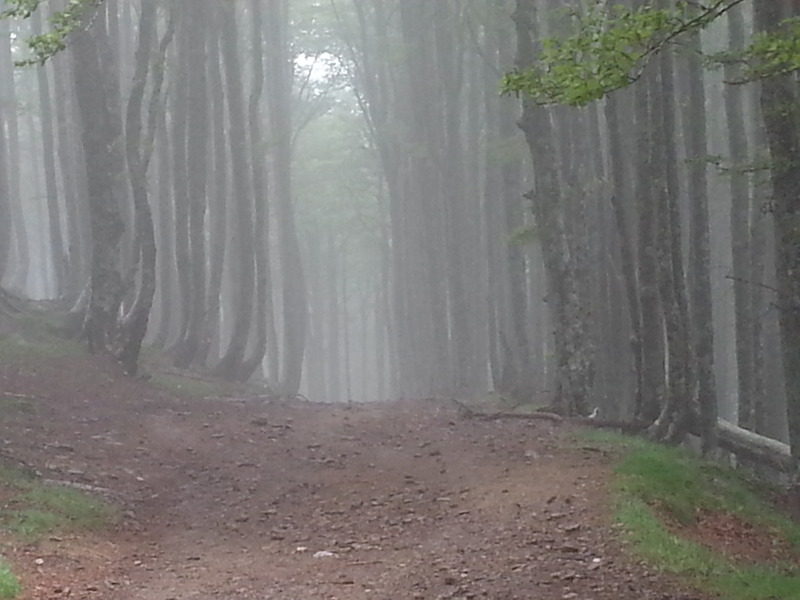 I can’t say I came on the camino looking for miracles but I believe I’ve found them anyway. I mean the way my body gets back in line after being marched into the ground. And especially after the bad news was reported and distributed to the entire interdependently connected bodily unit: I developed a blister on the ball of my right foot. 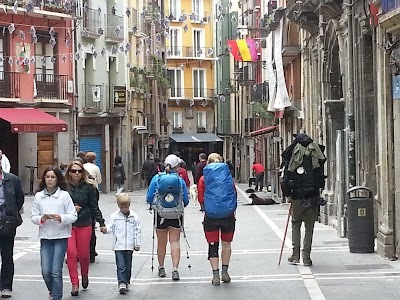 Blisters are the constant – and sometimes mortal enemy – of camino dreams. An average of 25 km a day includes an unfathomable number of steps. And an almost uncountable number of individual expressions of wincing pain. But, at some point it is hard not to become aware of the one – or many – something(s) greater that you are part of. 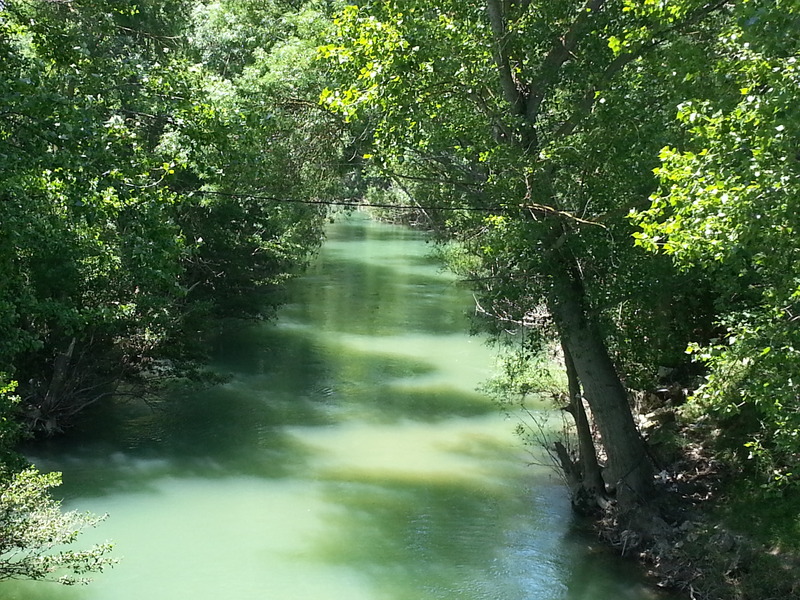 Some of it is the incredible and majestic beauty you are completely surrounded by. There is a good part of extended benevolence that you begin to attribute to the person walking alonside of you – with her own ailments and imperfections – who wobbles like you and and yet, like you, perseveres in the same loyal direction as you find yourself heading. And there is the slightly more esoteric – but at moments, undeniably real – connection that is cultivated with the collective of souls bound to this smae path as you… some known to you whom you have shared a glance or exchanged words or a sat down with for meal or a slept next to in the dorm. And there is the more mystical connection forged beteeen you and the souls who’ve traveled this way before you. And those who you know will follow you. Who will sleep in the same lumpy bed, listen tko the same caucophony of snoring each night, beg for the forgiveness of their feet – just like you so that, like you, they will begin to know that thing they came in search of in the first place: a greater understanding and appreciation of the connection with all things. Day three of walking had the good and merciful fortune of being significantly flatter then the first two days of walking. We passed through a number of very beatiful towns and villages and long stretches of covered trail winding alongside a stream bed. We passed a long stretch of farmland before finally joinin up with a road that led into the town square of Arre with a large cathedral with the bells striking as we passed at 11:00 am on Sunday morning – definitely not dressed for church. We enjoyed a sandwich with other pilgrims in a tiny bar along the main square. There we met Magdelana (Sweden) and Susanna (US) who escorted us along the last 4 or 5 km into the city sqaure of Pamplona where we decided to stay. When we arrived at the hostel, just inside the walled city of Pamplona, I came across an epiphany I had looked forward to discovering for years. 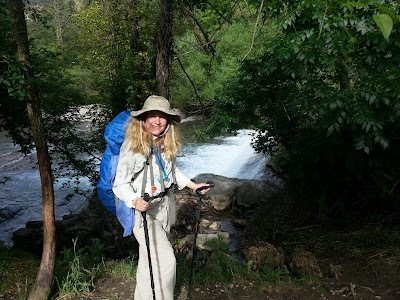 Ever since I began dreaming of going on this spiritual trek, I wondered about what I imagined to be a series of powerful and revealing philosophical and spiritual discussions shared between fellow msytic travelleers. I imagined that secrets of the universe or the human condition were shared and life would become much clearer and more meaningful. So, it was perhaps a little surprising – even a little disappointing to discover that the number one topic of conversation among fellow pilgrims is blister care. Where they form. Successful and not so succesful treatments. Wisdom of the ages and the breadth of experience handed down and shared among the weary and needy. This was soberingly mundane until I realized how remarkably and universally spiritual this really was. How we look around and notice the ailments of our fellow travellers. How we confessionally and publicly reveal the pain and the vulnerability of being alive on this winding but unbending trail together. How we can see the humility reflected in everyones eyes from having encountering the impact of racing out to meet a world unable to bend or bow to our limitations. But, when thought about more, it becomes clear that the world must understand the pain of the countless souls pressed into the hard folds of its epoch-long existence. That it can´t express it´s empathy or cooperative benevolence in words we understand does not mean that it can´t understand our hopes or dreams or ambitions. Perhaps that is why it so unceasingly projects its beauty out toward us in every moment. Why that beauty is so alluring and calls to us constantly. Why we understand that beauty not only as a physical thing detatched from us and all around us, but a beauty inscribed within us and part of everything we think, feel and are. That is the feeling that comes through after several hours of commiseration with fellow pilgrims, comparing war stories of the road. What is demanded is a little suffering and the humiliation of coming face to face with physical limitations. What is gained is the countless fortune of understanding that you are not ever as alone in this universe as you thought you were. What would our world be like if all of us – every day – could regard our fellow travellers in this revelatory way? After a home made dinner bought in one of the shops (four cheese speggetti and bratworst with apricots, cherries and an apple (with pudding for desert), we settled down for a little more wound care (internal and external) and bedded down for the night to settled the bodily debt recorded during the day. Tich Naht Hanh wrote a nifty little book called ‘Peace is Every Step’. But I guaruntee he wasn’t on one of the first five days of the Camino or else it would have been called ‘Pain is Every Step.’ Getting up out of bed – even just the act opening my eyes as if I had the intention of getting out of bed – triggered every every pain receptor in my body requiring an individual manual override step for every body part. The most persistent warning signal came from the union of muscles around my ankles which, in the middle of the night called a secret meeting, voted and decided to go on strike. The knees also met and voted just to put me to death but simply whimpered their way through the night without taking any action. There are over two hundred bones in your foot and yesterday was the first day they all got together and unanimously determined that I was no longer competent to run the company. All this, and yet, at six-thirty when the music came on and everyone scurried into place, my body complied with the massive cultural (or multicultural) peer pressure to return to the program and slowly, methodically follow through on the plan to commit pedometric suicide. I will testify now to the amazing resilence of the human body. Not he forgiveness, mind you… but the resilience. Once we got out on the road (slightly behind the forward edge of the crowd, but certainly not the trailing edge) it was as if everything was back on auto-pilot. A few curse words needed to be edited out of the official blog, but all body parts were, basically, doing what they were supposed to. And yet, I gained an special appreciation for ‘compensation injuries,’ where when a certain muscle was not quite pulling its weight, it called in all the nearby muscles to try to cover for it and protect it. It never goes for very long without those other muscles also beginning to fail. But the weather cleared and it was a beautiful blue-skied day which made the beauty of the area we passed through seem even more gorgeous. I did notice, however that the scenery looked at from a slightly uphill or slightly downhill angle is not nearly as apprecciated as the scenery seen through eyes gazing out at a flat angle. I tried to override environmental controls only to discover that I actually had little to no say on setting the environmental difficulty level (unlike the treadmill back home). 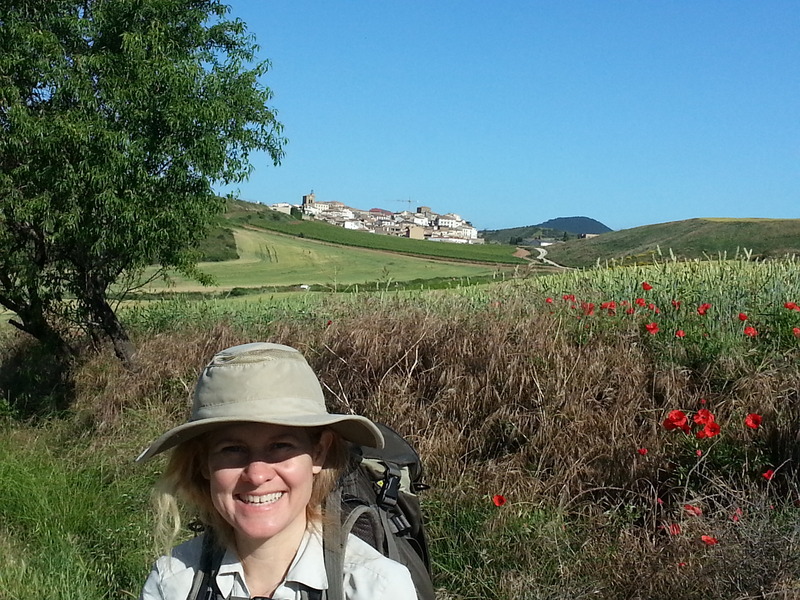 Letting go of control is one of the first and most primary lessons learned along the Camino. The guide book says today’s 28 km is on of the most picturesque on the whole camino and even in my pain, I couldn’t argue. 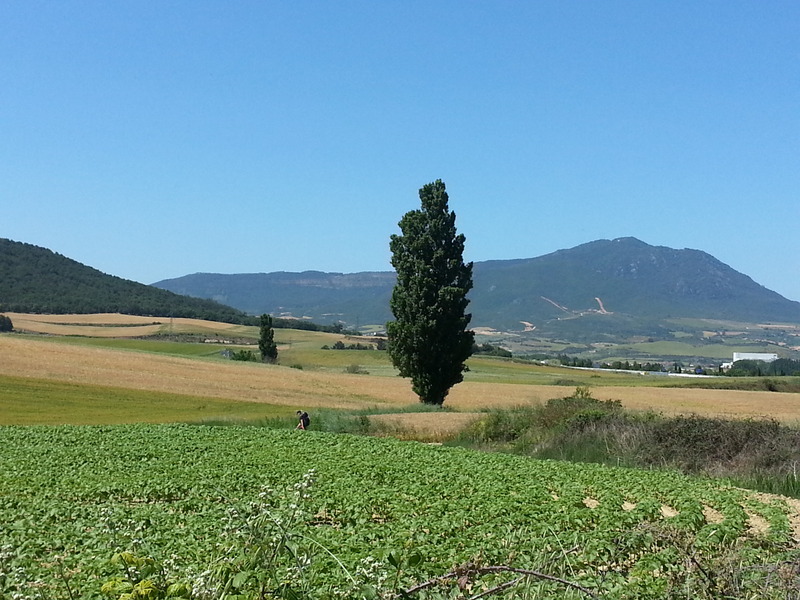 Spain is a lot more green and lush than the arid dry image I’d formed of it. And it has a lot more hills too. I didn’t actually end up taking any photos of day 2 only because my body wasn’t willing to listen to any other mechanical override impulse like picture-taking as opposed to getting one step closer to a soft place to sit, take off the pack and shoes and unharness myself from this mule-like life I´ve committed myself to for the next five and a half weeks. 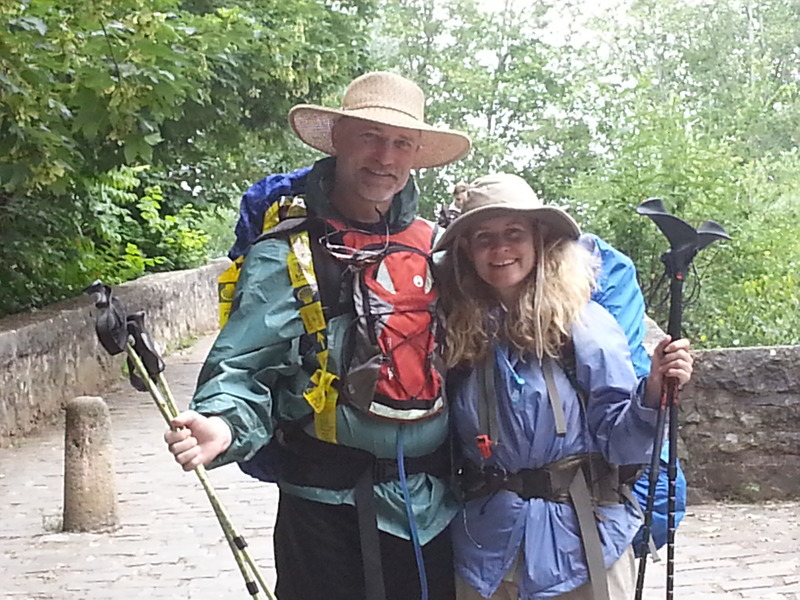 Awoke in L’Esprit du Chemin in St. Jean Pied du Port at the crack of 6 (midnight in the last time zone we knew). To the piped in sound of women’s chorus chanting, we put our gear in order for the 28 km trek ahead. We started with rain gear as the day looked at little misty at first sight and ranged from drizzly to downright rainy after a more experiential opinion. 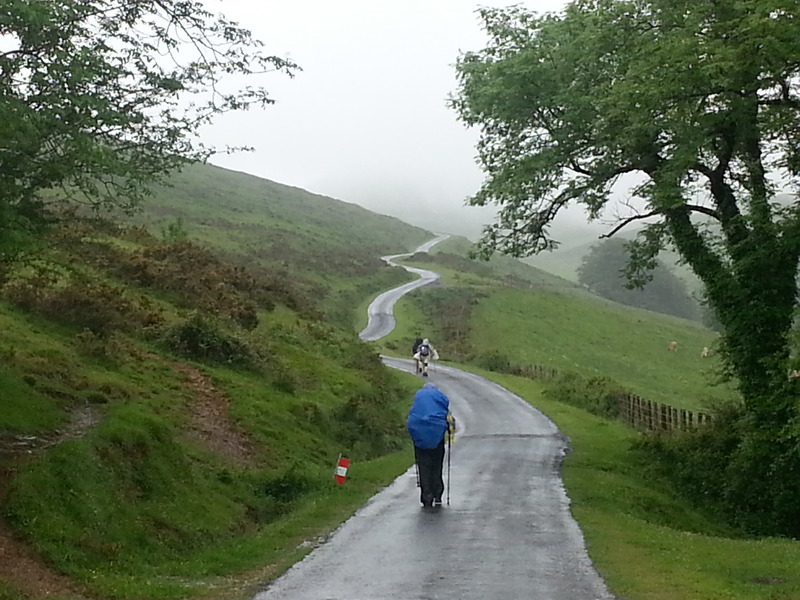 The gear kept us dry, but because we climbed from 200 meters to 1800 and then back down to 1400, we sweated a lot. Rain gear, at least the cheap kind we became very familiar with, is (like it purports to be) a barrier to water – whetber it is outside trying to get in or iside trying to get out. Either way we were wet… but not cold. The mud was exciting if you are in to unexpected slippery and dirty forms of punishment – no falls but considerable boot leakage. Since the constant worry of blistrers is drilled intot the mind of every pilgrim, we were constantly aware of whether our feet were wet or dry. 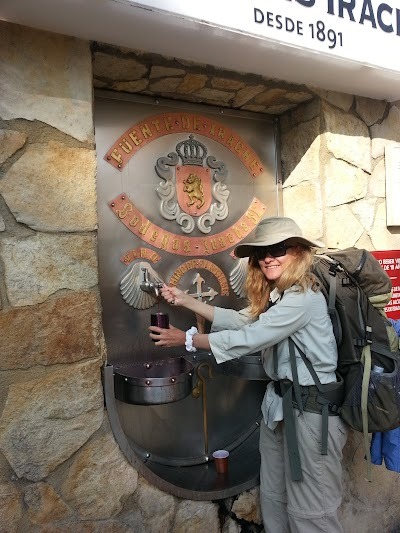 with 200 of our closest pilgrim friends were staying, we had changed the tone in which we were uttering the familiar phrase of pilgrims, ‘bon camino!’ |They we’re going to stamp my pilgrim’s passport but when I pulled it out I found that it was all wet – sweat completely through. Laundry and a pilgrim menu dinner of fresh water spanish trout, french fries (even though, technically we were in Spain now) and pasta, and chocolate pudding – high calorie meal for a high calorie day. 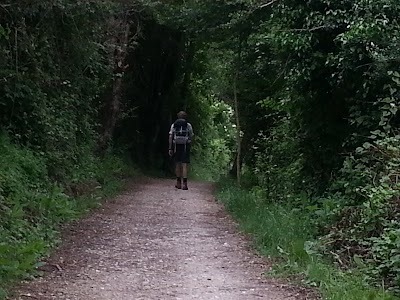 Went to bed afraid I wouldn’t be able to get up in the morning… the shortest Camino ever. C’est bon! We arrived at about 8 pm last night after 28 hours of travelling. Everything was good for our journey with the exception of having our plane delayed getting us form DCA to JFK forcing us to run through JFK to catch our connection. The flight from NY to Madrid was superb being fed a nice meal with wine and a small boxed breakfast. Managed to get a few hours of sleep on route. We are in L’Esprit du Chemin with 25 other pilgrims. This ‘refugio’ is hosted by Roberta and her husband (who is working an we didn’t get to meet him. 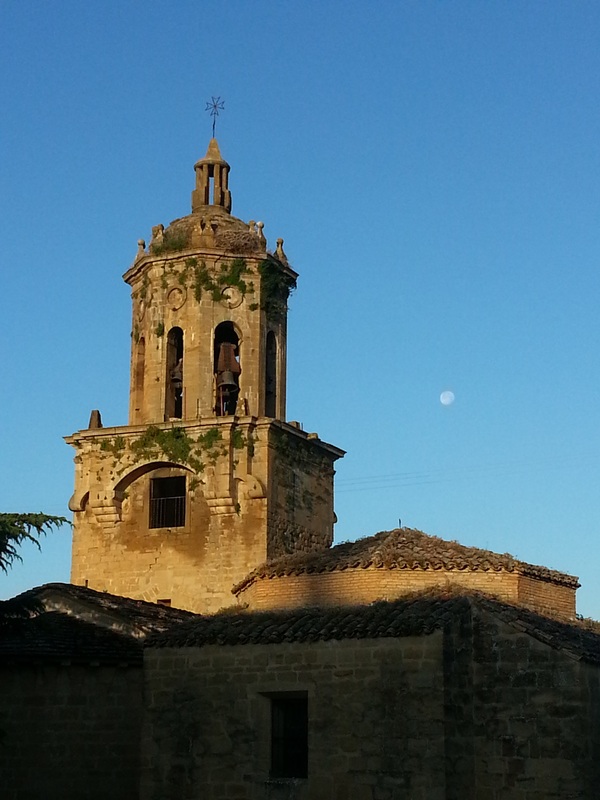 After completing he r second camino she and her husband had the idea of being hosts and bought this place. It has three large rooms each with about 14 beds – all coed. 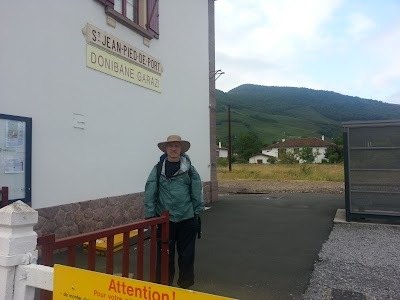 Delighted to get off the bus taking us from San Sebastien to St. JEAN pied de Port in time for dinner with all the other pilgrims – some of whom were like us – on their first day of their camino. 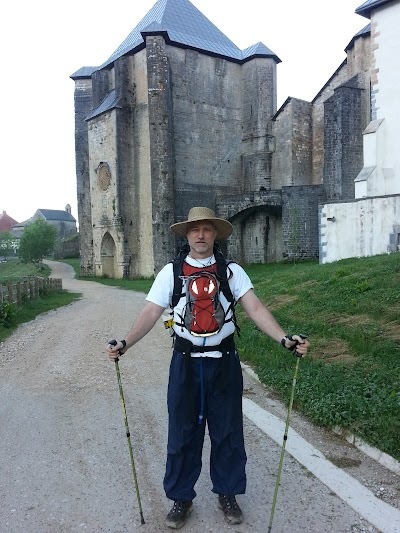 But there were also those like Henrick from Belgium who began his journey from his home… and like William who lived his whole life in Toulouse right up the road and has been walking for 4 days. Thre is a South African father daughter who now live in Malaga, Spain, a charming Italian student who is biking the Camino a mother and daughter (80 and 55) from Sweden, a husband and wife from Provence and even one other young man from the States (St. Louis). There is a woman from the Netherlands who is on her 4th the camino. She is taking a sbort two week respite to act as a hospitalier – a guide or volunteer who helps othe pilgrims on their way – much like a boddisatva. This place she has chosen is an important junction. 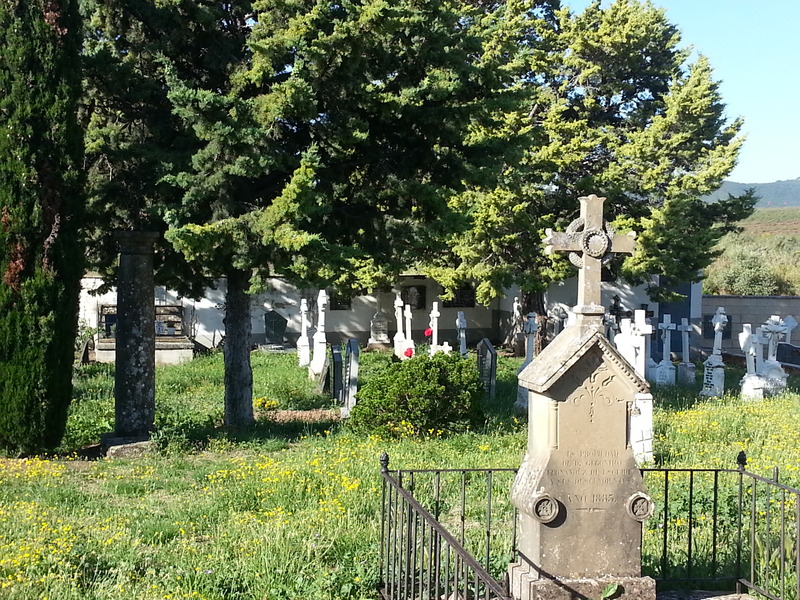 All other paths feed ointo St. Jean to complete the final 750 km. It is neither the beginning nor the end but a place where people in the middle meet. Stories are shr ed. There are people here like us who are just starting and their are people who have much travelling and stories already logged. After a great breakfast of muesli and bread with chocolate sauce – a European specialty) we \got our pilgrim passports stamped with their first stamp and we are ready to embark on the adventure of the Camino!